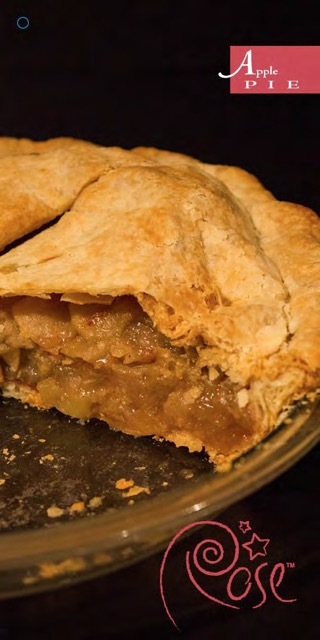 I have many recipes for pie crust but through the years, this is the one I turn to the most often quite simply because it has a wonderful texture and also a wonderful flavor. This recipe makes 312 grams, enough dough for one 9 inch pie or tart shell, and can be doubled to make a double crust or lattice pie. 1) Process flour, salt, and baking powder to blend. 2) Add cream cheese and process until coarse. 3) Add butter cubes and pulse until peanut size. 4) Add cream and vinegar and pulse until butter is the size of small peas. 5) Scrape dough onto a lightly floured work surface. Use latex gloves or cover hands with plastic bags and press dough until it holds together in one smooth flat disc. 6) Wrap, and refrigerate 45 minutes before rolling. * Baking powder containing aluminum has a bitter flavor. Most health food stores and many supermarkets carry the calcium variety. You can eliminate the baking powder and double the salt but the crust will be less tender. * I like to roll my pie crusts no thicker than 1/8 inch and preferably between 1/16 and 1/8 inch thick. We have two videos on YouTube channel for seeing the pie crust made and rolled out. On Rose’s YouTube page: SEARCH for 01 Perfect Flaky Pie Crust a VideoKraft production, in which Rose is making and discussing a butter pie crust. But the technique is the same. 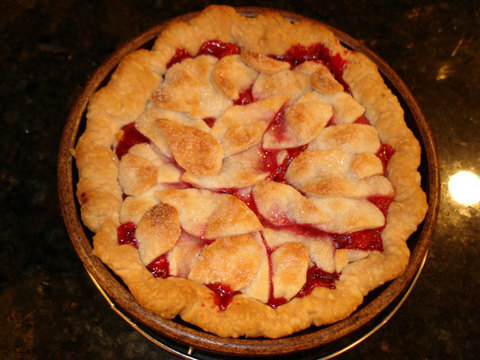 American Products Group has the below video using Rose’s Signature Pie Kit. 1. Grind ladyfingers, granulated sugar and kosher salt in food processor until ladyfingers are fine crumbs. 2. Add pecan pieces and pulse until mixture is homogenous. 3. Add melted butter and pulse until incorporated evenly. 4. Pour mixture into 9.5-inch pie pan and press into pan to form even crust. 5. Freeze until solid, about 15 minutes 6. Bake at 375°F for about 12-14 minutes until lightly browned. Cool before filling with custard. 1. In a large bowl, whisk eggs, granulated sugar and flour together. Add coconut cream, buttermilk, vanilla extract and salt and mix thoroughly. 1. Place heavy cream, medjool dates and coconut chips into sauce pan and warm to a slight simmer for about 20 minutes. 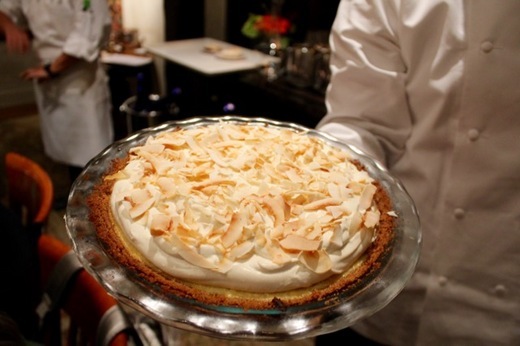 Cream should have slight notes of coconut and be gently sweetened with coconut. The season for Concord grapes is short but as the skin on the grapes is very thick they freeze perfectly for well over a year, especially if placed in ball jars.I now prefer to thicken the filling before baking. Allow it to cool to room temperature before scraping it into the pie shell. I just saw this very special writeup of The Baking Bible, in "The Jewish Weekly," by Helen Chernikoff, which includes not only a little story about my heritage and inauspicious beginnings as a "food critic," but also the recipe for my new and best apple pie. If you don't have the book and are still thinking about what to make for Thanksgiving, here it is! Milk Chocolate Caramel Tart The smoothest, creamiest, most milk chocolaty filling which melts in your mouth, contrasted with a fine layer of creamy caramel, and thin crisp buttery cookie crust. This is truly one of the most delicious things I have ever tasted. It all began with an informal book signing that Woody and I had at the Belvedere Farmer's Market last summer. 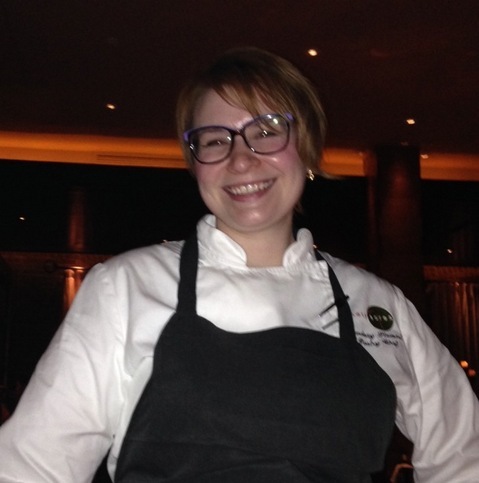 A neighbor introduced herself as the mother of a pastry chef--Lindsay Stewart, at a New Jersey culinary school restaurant called 90 Acres, in Peapack, a 40 minutes drive from Hope. We were waiting for a special occasion to visit and it arrived this past March when we invited Woody to celebrate his birthday. Lindsay and I exchanged a few emails in the course of which I knew I had met a kindred spirit. Here is an excerpt of one: Our two best selling dessert items are an ice cream sundae and a pie of the day. That's what people want, simple and delicious. I feel like some chefs lose sight of that when they are creating. That bleeds into the cake business as well. I don't consider something that is made out of cereal treats and a substance similar to Play-Do a cake. It's sad really how many people are surprised when they eat my wedding cakes that they actually taste delicious as well as being beautiful. It hurts my heart because that's the point of pastry, isn't it? To taste good. Yes! It was love at first write. We were all immediately impressed by the location of the restored carriage house set amidst the rolling hills of Somerset County NJ, and the refined but comfortably informal atmosphere of the main dining room. Dinner began with a tasting of extraordinarily delicious salumi cured from the culinary center's own pigs. It was accompanied by bread so good I had to ask where it came from and not surprisingly, it was from Balthazar's Bakery in Tenafly. We were all completely sated by the time dessert rolled around so we decided to share just one and what a one!!! I woke up the next morning still thinking about it. A day later I found myself wishing I could have another serving. Finally I summoned my courage and wrote to Lindsay asking if she would share her recipe, hoping hoping. But I wasn't surprised when she said yes, because anyone who could create such a glorious thing would have to be a beautiful and sharing person. 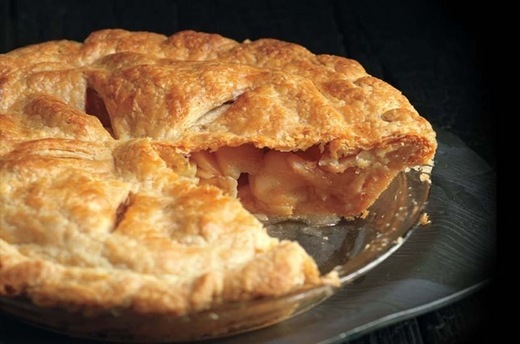 The original recipe was made in the form of a pie with the most tender/crisp crust that was, of course, made with lard, but not just any lard--it was lard from the culinary center's own pigs. Normally I prefer lard crusts only with savory pies but the flavor of this one was perfectly compatible with a dessert pie. Lacking access to this type of lard I decided to make the pie as a tart and use a cookie tart dough (pâte sucrée). An added benefit is that this dough never gets too firm when chilled and the richness of the chocolate filling benefits from slight chilling. We will return soon to 90 Acres but not for a special occasion because being there IS the special occasion. Chill the Dough Flatten the dough into a 6 inch disc. Wrap it well and refrigerate it for 30 minutes, or until firm enough to roll or pat into the pan. It can be refrigerated for up to 3 days or frozen for up to 6 months. If chilled for more than 30 minutes, it can take as long as 40 minutes at room temperature to become malleable enough to roll. Roll the Dough Set the dough between lightly floured large sheets of plastic wrap. Roll it evenly into a 1/8 inch thick disc larger than 12 inches in diameter. While rolling the dough, sprinkle it with a little more flour on each side as needed and if the dough softens significantly, slip it onto a baking sheet and refrigerate it until firm. From time to time, flip the dough with the plastic wrap and lift off and flatten out the plastic wrap as necessary to make sure it does not wrinkle into the dough. Line the Tart Pan Remove the top sheet of plastic wrap and use the expandable flan ring, or a pizza wheel or small sharp knife with the cardboard template as a guide, to cut a 12 inch disc. If using the pizza wheel or knife, take care not to cut through the bottom plastic wrap. (Excess dough can be frozen for several months.) If the dough softens after cutting, refrigerate it until firm. It will not drape over the pan unless it is flexible, so if it becomes too rigid in the refrigerator, let it sit and soften for a few minutes. Invert the 8 inch cake pan onto a work surface. Use the bottom sheet of plastic wrap to lift the dough and set it, plastic side down, over the 8 inch cake pan. Smooth down the sides so they will fit into the tart pan and place the removable bottom of the tart pan on top. Then carefully place the fluted ring, upside down, on top. 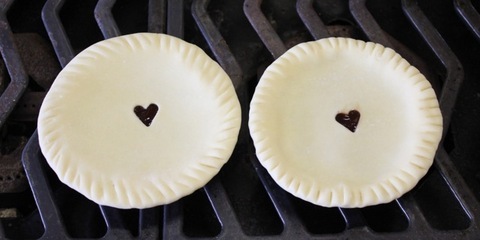 Place a flat plate or cardboard round over the tart pan to keep it from separating. Invert the pans and remove the cake pan. Carefully peel off the plastic wrap. Gently ease the dough down to reach the bottom and sides of the pan. If the dough breaks when transferring it into the pan, patch and press it into the pan with your fingers. Fold down the excess dough to create a double layer for the sides of the tart and press it against the sides of the tart pan so that it extends 1/8 to 1/4 inch above the top. If the dough is thicker in places, press it so that it becomes thinner and rises no higher than 1/4 inch. Use small sharp kitchen scissors to trim it to 1/4 inch above the top of the pan. Also, if patting it in by hand, press the dough at the juncture where the bottom meets the sides, which often tends to be thicker. For a decorative border, use the back of a knife to make diagonal marks using each flute as a guide. Chill the Tart Shell Cover with plastic wrap and refrigerate it or freeze it for a minimum of 8 hours. Preheat the Oven Thirty minutes or longer before baking, set oven racks at the middle and lowest levels and preheat the oven to 425˚F/220˚C. Bake the Tart Shell Run a finger along the outside fluted edge of the pan to make sure that no dough is attached. The dough must not extend onto the outside of the pan or, because the sides slip down a bit on baking, it will make a hole when the baked crust is removed. Line the pan with the coffee filter or parchment and fill it three-quarters full with beans or rice to weight it, pushing the weights up against the sides. Carefully transfer the tart pan to the foil-lined baking sheet and set the tart on the lower rack. Make the Caramel Place the baked tart shell near the cooktop. Have ready a small offset spatula lightly coated with nonstick cooking spray beside it. In a medium heavy saucepan, preferably nonstick, stir together the sugar, water, corn syrup, and cream of tartar until all the sugar is moistened. Heat, stirring constantly, until the sugar dissolves and the syrup is bubbling. Stop stirring completely and allow the syrup to boil undisturbed until it turns a deep amber (370˚F/188˚C). Remove it immediately from the heat as it will continue to rise, or remove it slightly before it reaches temperature and just as soon as it does, pour in the hot cream and then the butter. The mixture will bubble up furiously. Add the optional salt and gently stir just to incorporate all the ingredients. Immediately pour the caramel onto the baked tart shell. 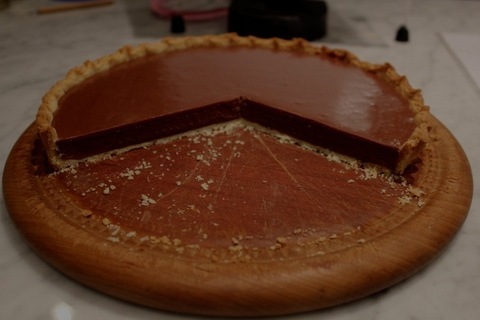 Tilt the tart shell back and forth to spread the caramel evenly to cover the entire bottom of the tart shell. Allow it to cool completely until the caramel has hardened. If necessary, set it in the refrigerator or freezer for a few minutes before adding the chocolate. Make the Milk Chocolate Ganache Have ready a fine-mesh strainer suspended over a medium glass bowl. In a food processor, process the chocolate until very fine. Pour the corn syrup over the chocolate. In a 2 cup microwavable measure with a spout (or in a small saucepan over medium heat, stirring often) scald the cream (heat it to the boiling point; small bubbles will form around the periphery). With the motor running, pour the cream through the feed tube in a steady stream. Process for about 15 seconds until smooth. Scrape down the sides of the bowl and stir to make sure all the chocolate has melted. If any particles remain, process for a few seconds more. Press the ganache through the strainer into the silicone or glass bowl or the top of a double boiler. Complete the Tart Microwave the ganache for about 20 seconds or heat just until lukewarm (an instant-read thermometer should read 96˚ to 100˚F/36˚ to 38C). Pour it over the caramel. It will form a smooth layer. Any large bubbles that form can be pricked with a clean needle. Note: If using a lower cacao percentage chocolate the filling will be sweeter and less firm so you will need to increase the cacao percentage by adding unsweetened chocolate. Guittard 38%, for example will require the addition of 10 grams/0.5 ounce of unsweetened chocolate. Calculate how much you need based on the difference in percentage, for example, if 35%, which is 5% lower than 40%, you will need 5 grams unsweetened chocolate for every 100 grams of milk chocolate which totals 22 grams for 454 grams/1 pound. 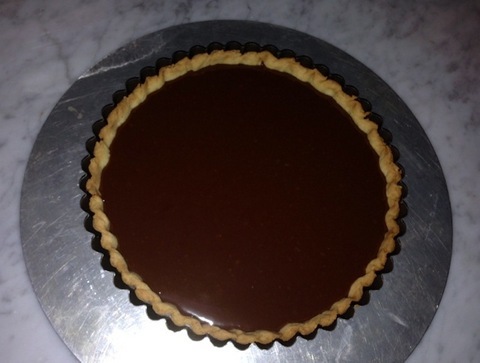 Refrigerate the tart, uncovered, for at least 4 hours or until the ganache has set. Unmold the Tart Remove the tart from the refrigerator. 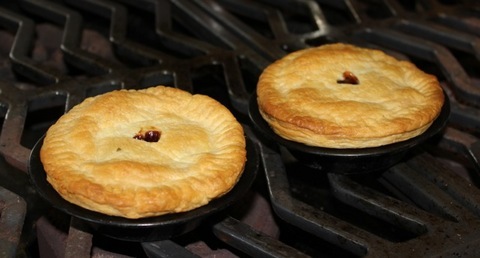 Place the tart pan on top of a canister that is smaller than the opening at the bottom of the tart pan's outer rim. Press down on both sides of the tart ring. It should slip away easily. Set the tart on a hot towel to soften the butter that will have hardened between the crust and the pan bottom. Slide the tart onto a serving plate. Allowed it to sit at room temperature for 20 to 30 minutes before serving. 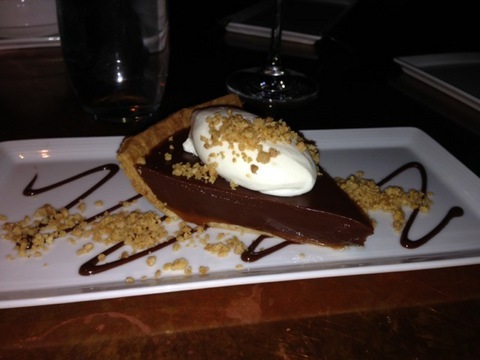 The chocolate filling is most creamy and delicious when slightly cool. If desired, spoon unsweetened lightly whipped cream on the side of each slice. The olive oil crust lacks both the flavor and the flakiness of a butter or lard crust but it has several valuable virtues in addition to being suitable for the lactose intolerant or those orthodox Jews who wish to have a pareve pie crust for eating with a meat meal. The oil crust stays soft in the refrigerator and never becomes hard even after baking which means one can use it with pie or fillings, which require refrigeration. The crust rolls like a dream, requiring hardly any flour to keep it from sticking. It holds together well yet is tender when baked. And it doesn't shrink on baking! In a food processor, process the flour, sugar, salt, and baking powder for about 20 seconds to mix well. Add the oil and eggs. Pulse repeatedly until the dough forms little moist particles. Empty the dough into a large plastic bag or sheet of plastic wrap and use the outside of the bag or the wrap to press the dough together into a smooth mass. Flatten the dough into a disc, wrap and chill it for a minimum of 30 minutes up to 3 days. *If measuring instead of weighing, stir the flour lightly with a whisk or fork, dip the measuring cup in and use a level blade to sweep off the excess. When this blog was in its infancy, one of my first postings titled "Surrogate Baker" reported the story of a dinner invitation from our then new friend Leon Axel who lives across the street and featured a fruit galette that required emergency shuttling back and forth to our oven. 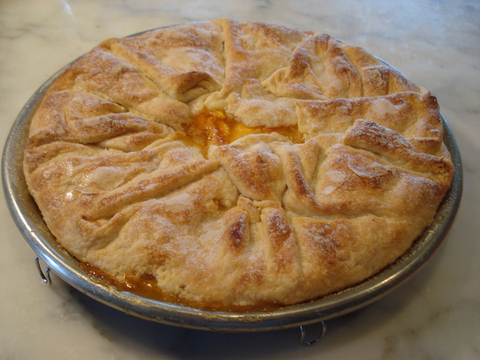 We have since gotten together for dinner many times but this week, when we carried this peach galette across the street to Leon's, I was reminded of the first visit just short of three years ago. Late in the evening there was an unexpected visit from Leon's son Nathanial and his lovely girl friend who were returning from a concert nearby on Bleecker Street and hadn't yet had dinner. So we started all over again with Leon's fabulous ballontine of duck with cherry ginger chutney, a mixed greens salad from the local farmer's market with herbs just snipped from his terrace garden, and then the galette. As this is the height of an exceptionally fine peach season, and the galette turned out to be so special, I want to share this with you immediately. Luckily I had the foresight to take several step by step photos of the process which I think will be helpful and maybe even inspirational! I'll admit that from beginning to end it took about 5 hours but I think they were 5 hours well spent. In fact, pot luck is really the way to go these days with no one having the time to make a full scale dinner except on very rare occasions. There was enough galette to serve 5 substantial slices plus slightly smaller ones for breakfast. Leon served a lovely and rare berry liqueur from Finland with the tart. When I was at the checkout counter the next day at Trader Joe's, the cashier asked me if I smelled lychees. I quickly realized it had to be the peaches. After peeling and slicing 9 peaches, the intoxicating floral aroma had impregnated everything I was wearing. It couldn't have remained in my hair as I had gone for my usual early morning swim. And what do you suppose I was thinking during that mile of laps? Hurrying home to eat that last piece of peach galette. Place the sliced peaches in a large bowl and sprinkle them with the lemon juice. Sprinkle on the sugar and pinch of salt and toss them gently to mix evenly. Allow them to macerate for a minimum of 30 minutes and a maximum of 1 1/2 hours. Transfer the peaches to a colander suspended over a bowl to capture the liquid. The mixture will release at least 1 cup up to 1 1/3 cups of juice. In a small saucepan (preferably lined with a nonstick surface) over medium high heat, boil down this liquid together with the butter to about 2/3 cup or until syrupy and lightly caramelized. The exact amount will depend on how much juice the peaches release which you will be reducing by about half. Swirl but do not stir it. (Alternatively, spray a 4-cup heatproof measure with nonstick vegetable spray, add the liquid and butter and boil it in the microwave, about 12 to 18 minutes on high--watch carefully as microwaves vary). Transfer the peaches to a bowl, pour the syrup over them, and toss gently. (Do not be concerned if the liquid hardens on contact with the peaches; it will dissolve during baking.) Add the cornstarch and almond extract and toss gently until all traces of it have disappeared. Remove the dough from the refrigerator. If necessary, allow it to sit for about 10 minutes until it is soft enough to roll. On a well-floured pastry cloth roll the crust into a 24-inch diameter circle. Fold it in quarters and transfer it to a 14 to 16 inch pizza pan, allowing the border to overlap the pan. 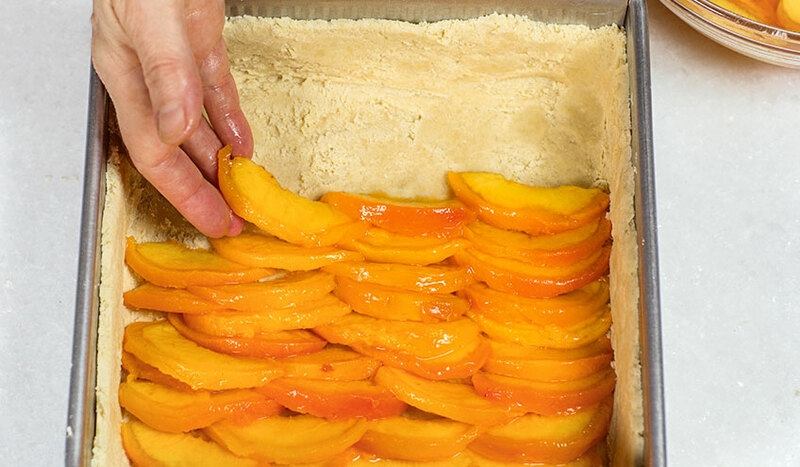 Scrape the peach mixture into the pastry and carefully drape the border over the fruit, allowing it to pleat as evenly as possible. It will leave a small area in the center exposed. Cover the galette loosely with plastic wrap and refrigerate it for one hour before baking to chill. This will maintain flakiness. Preheat the oven to 400°/200°C. at least 20 minutes before baking time. Set the oven rack at lowest level and place a baking stone or baking sheet on it before preheating. Place a large piece of greased foil on top to catch any juices. For a delightfully crunchy crust, spritz or brush the pastry all over with water and sprinkle with superfine sugar. Set the pan directly on the foil topped baking stone and bake 40-45 minutes the juices bubble thickly in the center opening and the peaches feel tender but not mushy when a cake tester or small sharp knife is inserted. Rotate the pan half way through the baking time. If it starts to over-brown, cover loosely with foil. Cool the galette on a rack for about 3 hours until warm or room temperature before cutting. The peaches should be ripe and yield slightly to pressure but firm enough to maintain their texture when baked. If squishy, they lose their character. To peel peaches, bring a pot of water to a boil, add the peaches and turn off the heat. Allow them to sit for 1 minute. Drain at once and rinse with cold water or place in a bowl of ice water. If the peaches are ripe, the peels will slip off easily. As you slice the peaches, toss them occasionally to coat with sugar mixture. Be sure to put a sheet of foil under the pie pan as there is always a little spill over with this much fruit. For a truly crisp bottom crust, this juicy galette works well baked directly on the floor of the oven for the first 30 minutes. Then raise it to a rack in the lower part of the oven. Understanding Concentrating the peach juices before baking keeps the filling juicy and requires only a small amount of starch to bind it. 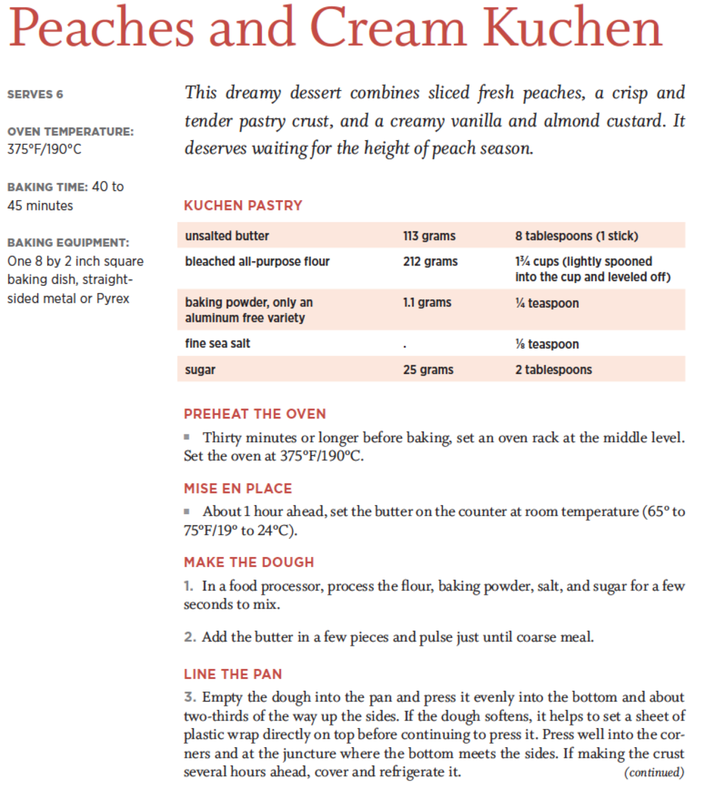 NOTE: For the pie crust, put Best Flaky & Tender Pie Crust in the search box and increase the recipe by 2 times to 624 grams. Rolling a crust this large and this thin can be tricky. This is a great dough--strong enough to roll thin but tender when baked. Be sure to roll the crust in a cool area--no higher than 75˚/24°C and work quickly. Move it on the cloth occasionally to ensure that it isn't sticking and add more flour if necessary. remember how i bitterly complained about the birds having pecked holes in the sour cherries, leaving them on the ground to rot? well nature once again has proven it's infinite balance! 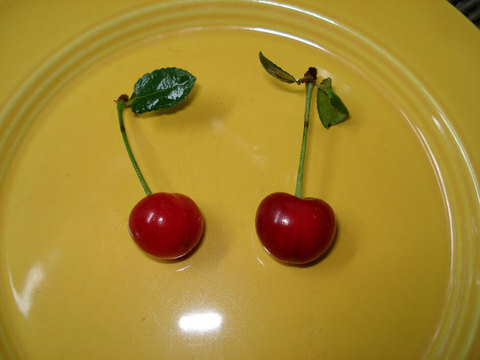 this weekend i discovered 50 perfect bright red unpecked cherries still on the tree! i also found a few currants hidden behind the leaves of the currant bush and overlooked by chipmunks and birds alike. i sprang into action and made what i call a windfall pielet! i always have some pastry scraps in the freezer so while they were defrosting i pitted the cherries and consulted the chart in my book (the pie and pastry bible) to see how much sugar and cornstarch were needed for each. this is where weighing really comes in handy. currants need more sugar and more cornstarch than cherries as they are more sour and more juicy as well. i had enough of the small currants to stuff one into each pitted cherry (i call this churrant pie) and the filling turned out to be the equivalent of a 1/4 pie. i used an antique 7 inch red stone pie plate but even a cast iron little skillet would have worked just fine! we had still slightly warm churrant pie for dessert for dinner and for lunch on sunday. how ironic that the cherry tree i planted in full sun that grew to bear many cherries was struck by lightening, but this scrawny old tree that i didn't even recognize as a cherry tree for many years, hidden in the shade, produced enough cherries at last to enjoy this amazing little treat! by the way, this little pielet took 35 minutes to bake in a 425 degree oven. i protected the edges with foil toward the end. and i didn't prebake the pie crust or the filling--i simply placed the dough leaves on top. it's easier for such a small pie. 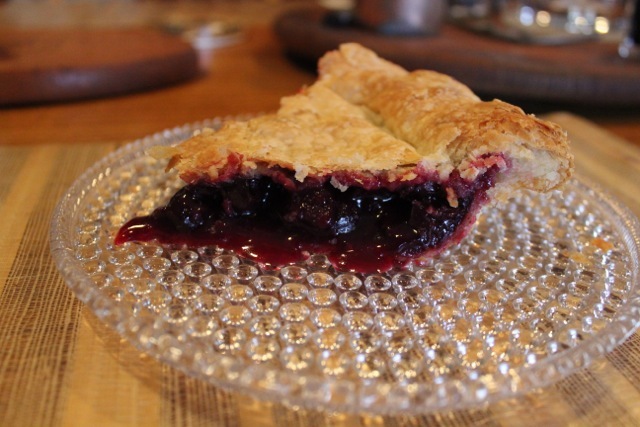 the recipe i'm offering here is for a full size one from "the pie and pastry bible." search out a large metal hair pin. insert the looped end into the stem end of the cherry and use it to lift out the pit. if you like this technique as much as i do, for future use, imbed the two ends of the hair pin deeply into a cork. i use a champagne cork as it is rounded and fits comfortably into the palm of your hand. 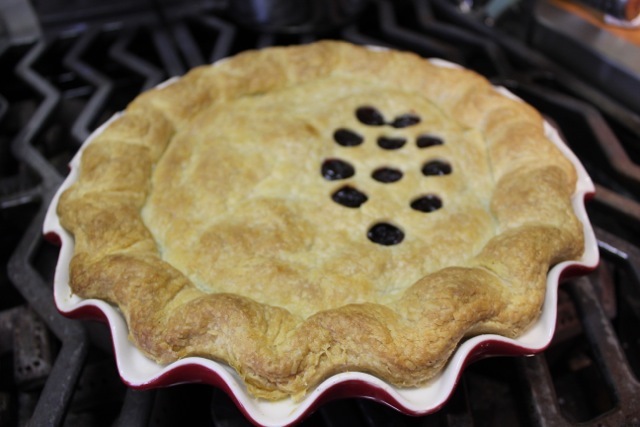 second tip: if you have a wine or root cellar, you can leave the pie dough in it until you are ready to roll it. most cellars are around 60 degree F. which is the ideal temperature at which to roll dough. the sad fact is that when the fresh fruit season is in full swing, it's usually too hot in the kitchen to make a good crust! i recommend countering this by making the dough early in the morning. if it's still cool in the kitchen (or dining/ living room if you are willing to roll it there) proceed to making the pie. otherwise, make the dough early one morning and the pie the following morning for best results. Oven Temperature: Preheat to 425°F. at least 20 minutes before baking. Remove one piece of dough from the refrigerator. If necessary, allow it to sit for about 10 minutes until it is soft enough to roll. Using a pastry cloth and sleeve, rubbed with flour or two sheets of plastic wrap, sprinkled lightly with flour, roll the dough into a 1/8-inch thick circle large enough to cut an even 13-inch circle. 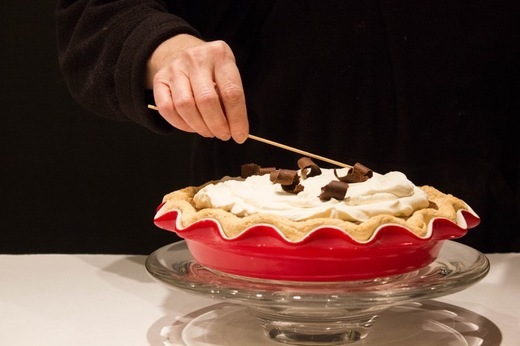 (Measure your pie plate from the top of one edge going down the sides, across the bottom and up to the opposing edge and add enough to tuck under for a nice edge—about 1 1/2 inches extra.). Fold this dough under so that it is flush with the outer edge of the pie plate. Cover the dough with plastic wrap and refrigerate it for at least 30 minutes. Preheat the oven to 425°F. at least 20 minutes before baking time. Set the oven rack in the lowest level and place a baking stone or baking sheet on it before preheating. Remove the plastic wrap from the dough and set a large coffee urn filter or piece of parchment in it. Fill it about three-quarters full with rice or beans and bake 20 minutes. Lift out the parchment with the beans and prick all over with the tines of a fork, but only half way through, i.e. not all the way to the bottom. Return it to the oven for 5 to 10 minutes more or until pale golden brown. (5 minutes for a partially prebaked crust). Check after 3 minutes and prick again if the upper layer of dough bubbles up. Roll the second piece of dough 1/8-inch thick and use a sharp knife to cut out about 18 leaf shapes, 3-inches long. Drape them over little clumps of aluminum foil set on a baking sheet. Brush them with the egg glaze if desired and bake them at 425°F for 10 to 15 minutes or until golden. Set them aside. Place all of the above ingredients (including the reserved cherry juices), except for the almond extract, in a medium saucepan and allow them to sit for about 10 minutes or until the cherries exude enough juice to moisten the sugar. Stir gently until evenly mixed and bring to a full boil, over medium heat, stirring constantly. Lower the heat and simmer for a minute, or until the juices thicken and become translucent, stirring gently. Remove it from the heat and stir in the almond extract. 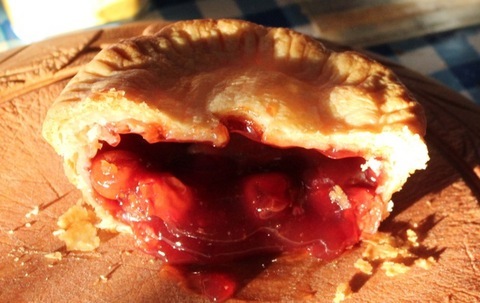 Pour the cherry mixture into the prebaked pie shell and bake at a preheated 400°F. for 15 to 20 minutes or until bubbling all over. If the edges start to brown too much protect them with a ring of foil. 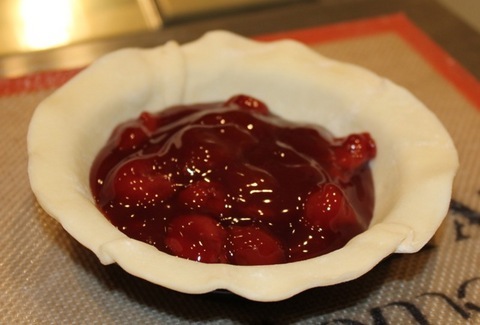 Remove the pie to a rack and while still hot, arrange the reserved pastry leaves over the cherries. Cool the pie on a rack for at least 3 hours before serving.